Overland Park is a great place for business or relaxation, or both - and the Wyndham Garden Hotel - Overland Park lets you enjoy it all. Conveniently located at the intersection of I-435 and Metcalf Avenue, our location is central to Corporate Woods Business Park, great shopping and wonderful restaurants. Easy highway access to Downtown Kansas City, The Plaza, Kansas Speedway, Kaufman Stadium and Arrowhead Stadium make the Wyndham Garden Hotel - Overland Park a prime location for your convention, vacation or training seminar Step inside our doors, and you'll appreciate our unique blend of modern convenience and classic Midwestern hospitality. Carefully detailed guest rooms make it easy to sit back and relax - or get down to business. And if you have a special event or meeting in mind, we're ready to help with flexible space and full catering services. After a long or busy day, treat yourself to a well-deserved break. Enjoy your favorite drink in our lobby lounge or choose classic American cuisine in the Garden Cafe. Go for a refreshing dip in our beautiful outdoor pool and spa or work out in the fitness center. Nearby Kansas City, Missouri, has plenty to offer in recreation, shopping, and dining experiences if you're in the mood to go out on the town. 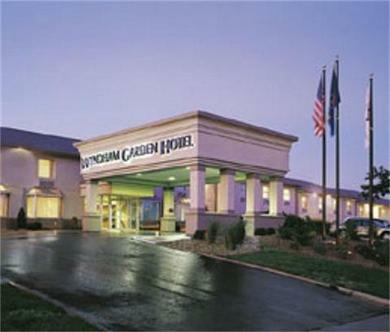 The Wyndham Garden Hotel - Overland Park makes it easy to enjoy your visit to America's heartland.